From the planets to the stars and out to the edge of the unknown, history and science collide in this epic exploration of the Universe and its mysteries. It's a very old universe. Yet just 50 years since man first ventured into outer space, the heavens are yielding their greatest secrets. 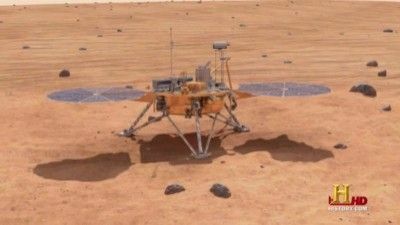 Robotic rovers give us eyes on the red rock of Mars--NASA probes slam into comets at hyper speed--deep-space telescopes capture violent images of the birth of stars and their collapse into black holes. All have significantly changed the way we see ourselves. We wonder, is there anywhere else out there that that can support life? 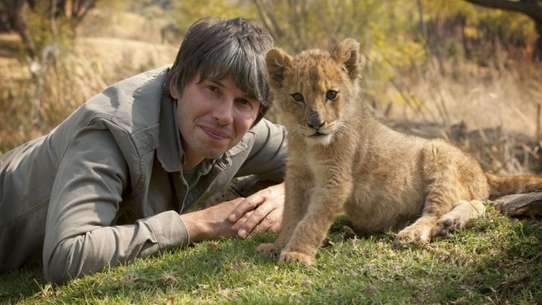 Episodes examine how discoveries were made and the scientists and explorers who dared to venture into the uncharted territory of the universe. 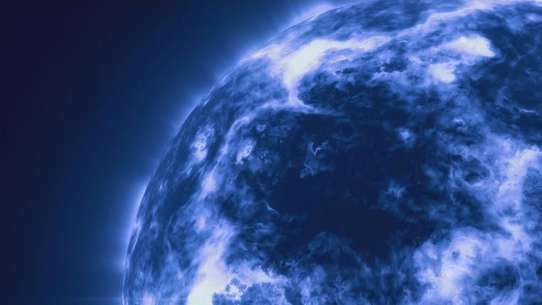 A look at the grim future of our home star, the sun, and what might happen to it five billion years in the future. 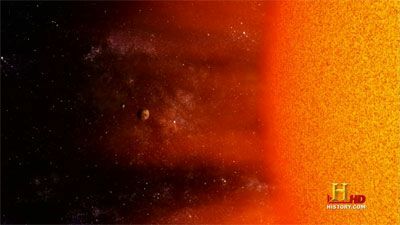 Also the results of the growing sun as it kills life, including humans, if they were still around. 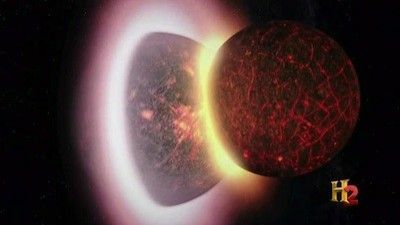 The planets of our solar system have experienced epic catastrophes throughout their long history, both raining down from outside and bubbling up from within. 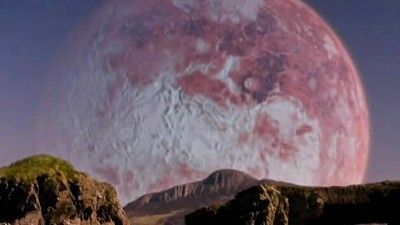 We'll voyage back in time to investigate the violent events that profoundly shaped the planets, including earth itself. We'll witness stunning revelations about what transformed Mars into a barren, hostile desert...The disaster that changed Venus from temperate to hellish...The impact that blew away Mercury's mantle, turning it into a planetary core...A colossal disturbance that rearranged the orbits of the gas giants...Titanic impacts on Jupiter...And how a lost moon may finally explain Saturn's rings. It may seem like seem like science fiction, but the cosmos isn't just something way out there. Many times in human history, objects or forces from space have changed the course of life on earth. 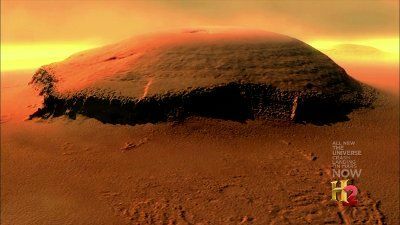 A look for evidence of life on Mars which provides many clues that it now, or once had supported it; from the remains of lakes and rivers that once flowed on the surface; to the water ice frozen at the poles; to the seasonal changes in methane gases that may prove bacterial life still thrives underground. An examination of the most powerful explosions and blasts in the universe. 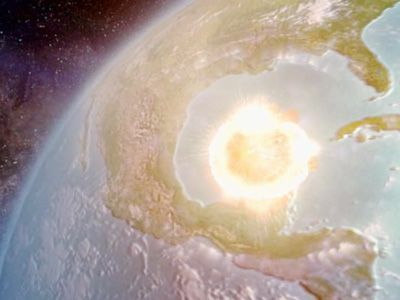 Includes a look at the Mexico's Yucatán peninsula and the impact which caused the Chicxulub crater. Also a look at gamma rays and Big Bang Theory. Earth may seem like the most hospitable planet in the solar system. But look again. Startling new discoveries reveal the blue planet has been plagued by more chaos and destruction than scientists once imagined. Stand on the Earth billions of years ago as a primitive planet slams into it. Shiver as our entire globe is frozen over like a gigantic snowball. 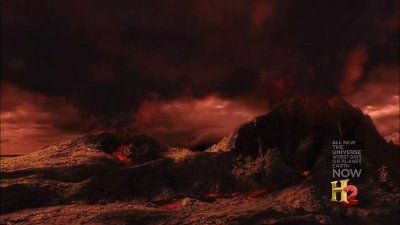 Feel the heat as mammoth volcanoes scorch the landscape and darken the sky. From a cosmic gamma ray burst frying away the ozone layer to an Everest-size asteroid slamming into the ocean, we'll reveal new information about how these unparalleled events drove life to the brink of total extinction. Out of this continuous devastation, how has our planet--and life--got to where it is today? Are the worst days behind us--or lurking in the distant future? Imagine a tornado so powerful, it can form a planet or how about rain made of iron. They are the one-stop-shopping places for learning all about the nature and variety of stars in the Universe. 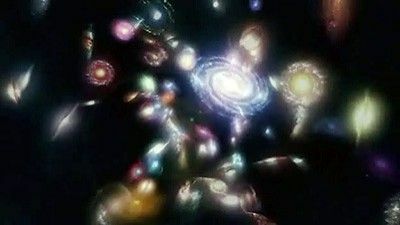 They're unique, because in clusters, all the stars were born at about the same time, from the same material and all are at the same approximate distance from Earth. 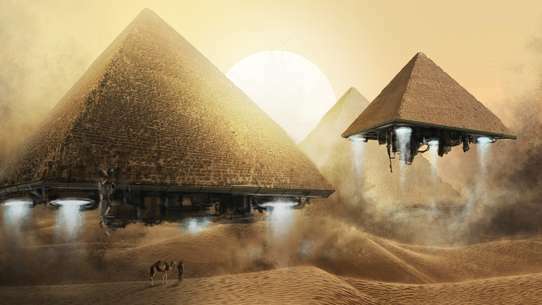 This means we can be sure that any differences among them are due to their true natures and not distorted by different distances from Earth and other factors. There have been both helpful and harmful effects on life on Earth from cosmic effects. Cosmic Phenomena includes the beauty of the Aurora Borealis and rainbows to the dangers of UV radiation and cosmic rays, from the miracle of photosynthesis to the thrill of a meteor shower as we explore the effects caused by the sun and other extra-solar sources, which can get under our skin and scramble man's technology, make life possible and be a threat to our existence all at once. They are breathtaking, lethal and a constant source of surprise. The stunning rings of Saturn have mesmerized countless scientists over the centuries. 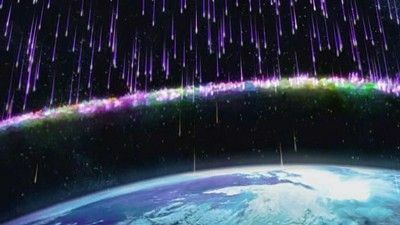 With particles the size of a house shooting at 53,000 miles per hour around the planet, any spacecraft passing through would meet an instant and catastrophic end. Inside the rings is like a NASCAR race - with bumping, jostling and frequent collisions that can cause a massive spin-out. 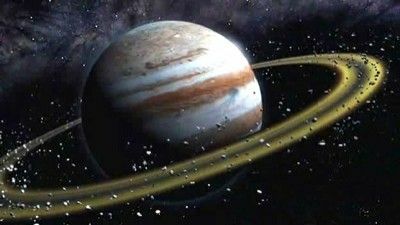 Lesser known are the other planets that have rings - Uranus, Jupiter, Neptune, possibly Pluto and Mars. Even Earth has a ring. Comprised of some 200 satellites in a geosynchronous orbit, it is the only known man-made ring in the universe. But the most remarkable thing about rings is that they contain the story of the birth of our solar system, and entire distant galaxies. Rings are more than a wonder of the universe - they reveal the secrets of our own origins. 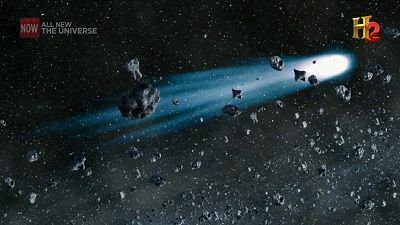 Board a virtual space ship to travel along with a variety of comets; long and short period, sun grazers, comets masquerading as asteroids and comets still in deep freeze in the Oort cloud. Then ride along on the NASA probes that visited nearby comets. Every year, thousands of objects both natural and manmade plummet through our atmosphere and crash into the Earth. These menacing messengers from the sky provide scientists with amazing insights into the natural, and not so natural, phenomena of the cosmos. From space rocks crashing through homes to cosmic boulders triggering mass extinctions to rocket parts landing on front lawns, explore objects that fall from the heavens, such as asteroids, comets, meteor showers and space debris. 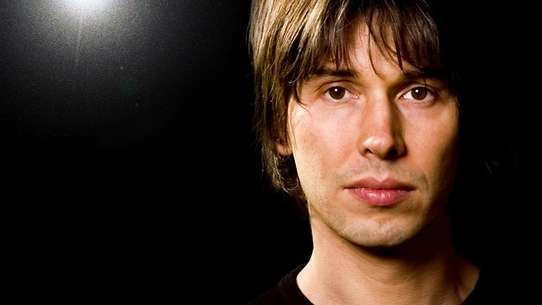 The key to understanding the universe seems to be understanding its smallest components. 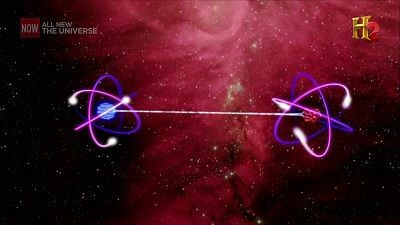 But reconciling the two has proved to be a tremendous scientific challenges as the behavior in the quantum realm bears little resemblance to the universe we know. This program explains some of the strange behavior scientists have discovered at the smallest scales. The majority of space exploration has occurred in Low Earth Orbit, around 120 miles above sea level. For a cool $20 million, any person can take a ride on the International Space Station, around the 1,100 mile band around Earth. 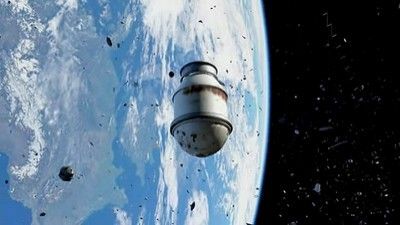 Commercial prospects for LEO are huge, there are big dangers lurking for anyone interested in traveling this way, such as radiation, , cosmic rays, and space debris numbering in the thousands threaten any spacecraft traveling in orbit. 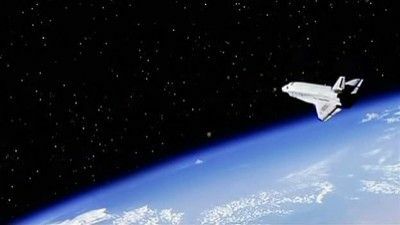 It's a new frontier and maybe the final frontier, and the possibilities are endless if you are willing to travel to the edge of space exploration. 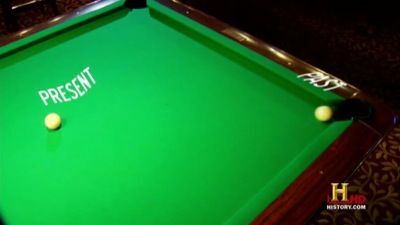 The biggest objects, farthest distances, and fastest speeds are made relatable through extreme physical analogies. We used to think that Earth was at the center of the universe, but now we know we're not even at the center of our own galaxy. 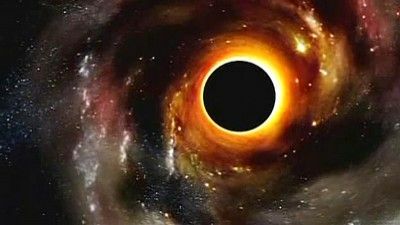 Countless wonders exist between where earth is situated and the massive black hole at the galactic center of our solar system. 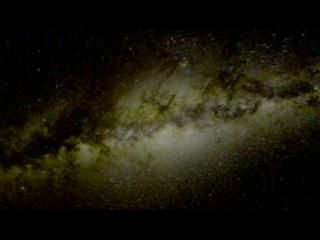 Within the Milky Way can be found the debris of old, dying stars fueling the birth of new stars and at the galactic center hypervelocity stars get catapulted clear beyond the Milky Way's outer rim at unimaginable speeds. Come along for a guided tour of 100,000 light-year-wide family of stars and stellar phenomena we call The Milky Way. 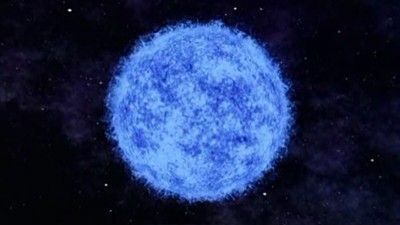 Season 4 opens with an exploration of dying stars, the process where stars become supernovas, and, occasionally, become the biggest blast in the universe as a gamma ray burst (GRB). 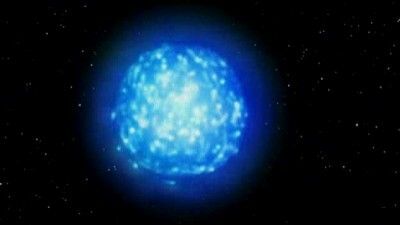 One death star, named WR104, lurks 8,000 light-years from Earth and some believe its GRB arrow is aimed directly at us. A death star galaxy named 3C321 is a frightening vision of what could one day befall the Milky Way galaxy: a companion galaxy's black hole being hammered with a constant blast of high-energy particles, wreaking havoc with its celestial bodies. 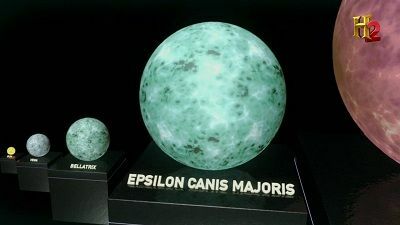 Nearby, Death Stars Eta Carinae and Betelgeuse burn through their fuel supplies as they hurtle toward extinction...which just may be too close for comfort. 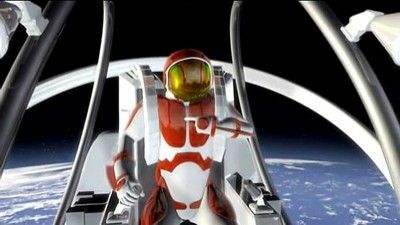 When man finally broke free of the Earth's gravitational pull the dream of traveling to other planets became a reality. 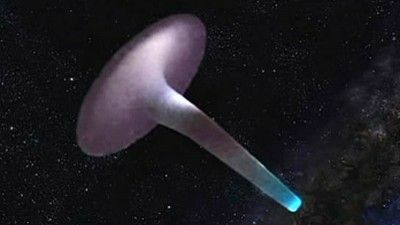 Today scientists are proposing a bizarre array of technologies in the hope of traveling faster through space, from space craft sporting sails that catch laser beams, to propulsion engines powered by a bizarre entity known as anti-matter. They sort of sound like the same phenomenon, but Pulsars and Quasars are very different. 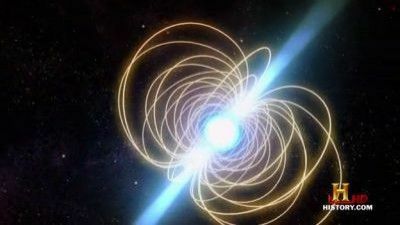 Pulsars are tiny--only a few miles across--but they spin as fast as a kitchen blender and sweep the sky with beacons of radiation that make them appear to flash on and off. They have unbelievably strong magnetic fields, are more accurate than atomic clocks...and they can even tell aliens just where to find the Earth! Quasars are at the other end of the spectrum. Quasars are huge cores of galaxies with black holes that are called "monsters" and which spit lobes of radiating gas called "DRAGNs." Quasars are so far away, we see them as they were only in the distant past--meaning they existed only in the early universe, when they may have played a major role in the creation of the galaxies themselves. 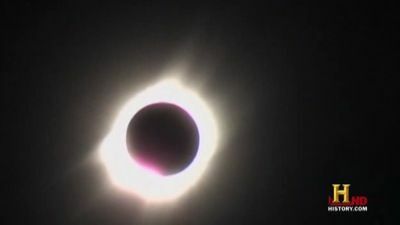 A look at the movements of the Earth, the sun and the moon during solar and lunar eclipses; how humans, if alone in the universe, may be the only intelligent creatures to witness these events; and how astronomers discover planets in other star systems that partially eclipse their stars. A look at time travel; how it could one day become reality; how Einstein's theory of relativity claims it is possible, and the probable results of traveling to the future and the mind-boggling consequences of traveling to the past. 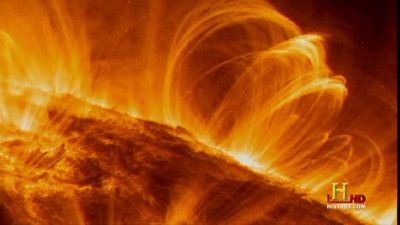 A look at magnetic storms – "Solar Katrinas" created by the sun with the power of ten-thousand nuclear weapons that could cause global electrical blackouts, electronics malfunctions and communication disasters if one should hit the Earth.